We are inventing a concept. 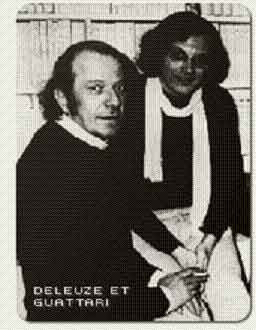 Our formula is derived from Deleuze and Guattari (D&G), especially from What Is Philosophy?, adopted as our guide, but not only from them. WIP? provides the Theory for our CATTt generator, meaning that our final poetics will emerge through the intertextual matrix of our source texts. For now, we want to know about D&G's concept (of concept). An additional caveat is that our framing is not the same as theirs. They believe that the concept as practiced in philosophy still has a role to play in contemporary civilization, and we would agree. However, our project is framed within the larger purpose of inventing electracy. Our concept is not confined to the professional or disciplinary parameters of philosophy. Rather, we want to create a means for theoretical thinking native to the Internet. The historical record (the grammatological analogy) shows that each innovation in forms and practices of thought preserved some parts of the previous mode, abandoned some parts, and added some new elements. Our electrate concept, in this spirit, will not simply reproduce D&G's proposal, but will revise it with our purpose in mind, looking for those aspects of their poetics that lend themselves to digital imaging, while deemphasizing other aspects that are relative to the literate apparatus. We have much to learn from them, but we have our own project.